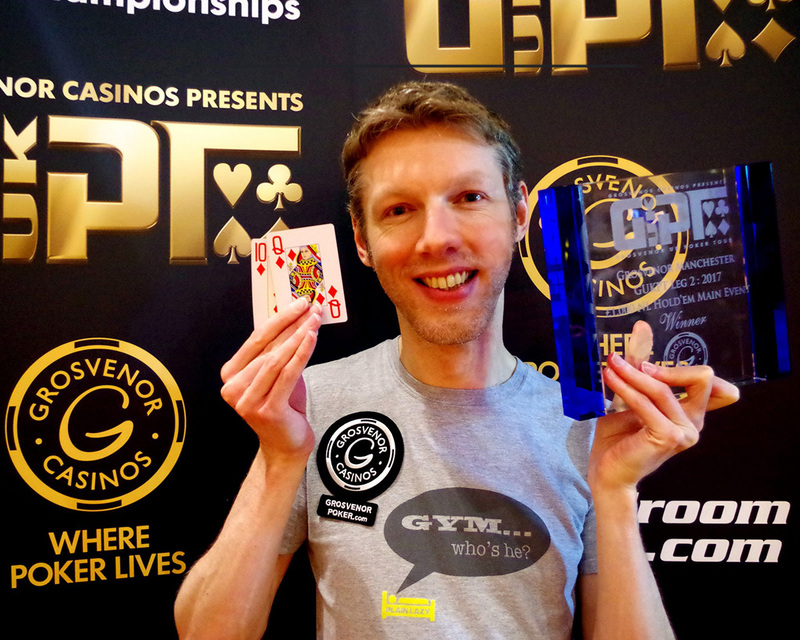 GUKPT Passport winner Andy “LogJam” Hill has won the GUKPT Manchester Main Event for £46,987 after cutting a four-way deal ICM deal with runner-up Tuan Le (£38,104), Mark Dyson (3rd, £45,899) and Endrit Geci (4th, £44,808). Local legend Daniel Charlton, the Day 2 chip leader, was seventh for £8.050. Join the action! The next event is GUKPT Edinburgh with a £100,000 guarantee Main Event from March 30 – April 2. Hills won the £10,000 GUKPT Passport leaderboard promotion after a determined bid to thrive both online and live last year. He snagged the prize after an run of amazing online results and a third place in the Salford 25/25. He was already a GUKPT and 25/25 Series regular but, thanks to winning the promotion, is now free rolling every leg of the 2017 GUKPT tour. Sensationally, he has managed to convert his Passport prize in to a £46,987 victory on only the second leg of the 2017 tour. Hills has a computer programming background and is also a classically trained musician who has dabbled in house/techno DJing and music production. He took up poker after watching late night poker shows on TV starring the likes of Vicky Coren, the late Dave “Devilfish” Ulliott and Phil Hellmuth and he has now been playing “seriously” for eight years. There were 268 entries for this year’s GUKPT Manchester, creating a monster prize pool of £268,000 - the biggest the event has had in years. 26 players finished in the money. There was a live stream throughout the event and, for the first the MainEventTravel.com-sponsored all-in triangles, were making their appearance. MainEventTravel.com is the GUKPT’s Official Travel Partner and can help with your travel needs for Edinburgh, and the whole of the 2017 GUKPT tour.